GREENSBURG, Pa. (D9Sports) – A-C Valley’s dreams of PIAA glory came to an end Friday night with a 59-36, not as bad as the score indicates, loss to Everett at Hempfield High School. A-C Valley (22-5) didn’t really have an answer for Everett leading scorer Kaitlyn Maxwell, who came into the game averaging 24.0 points per game. Maxwell scored 10 first-quarter points and 26 in the game. When Maxwell wasn’t scoring in the first quarter, she was finding Brooke Colledge open for a pair of opening-period 3-pointers that helped Everett build an 18-11 lead after eight minutes. Up seven going to the second quarter, Everett used a 15-4 run in the quarter fueled by 3-pointers from Kristen Ewing and Gabby Bulger to build a 33-19 halftime lead. 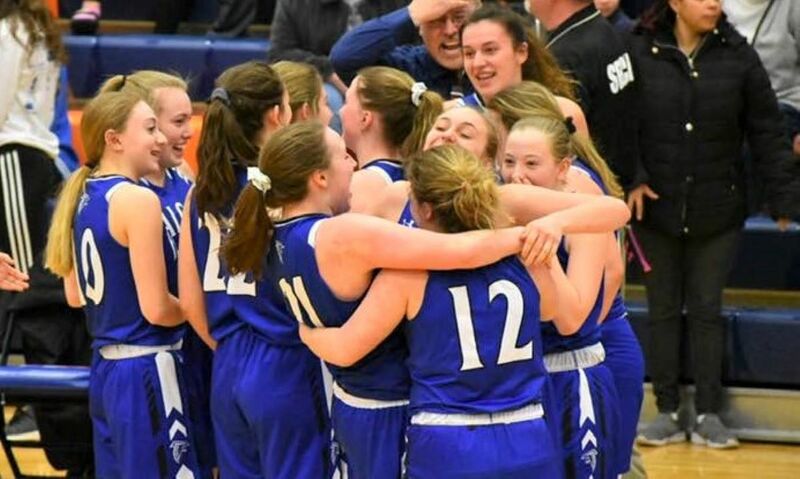 Down 14 at halftime, A-C Valley did what it has down so many times over the past couple of season – the Lady Falcons rallied. After Elizabeth Jay jumped the Warriors lead to 16, 35-19, on an offensive putback early in the second half, A-C Valley went on a 13-4 run that saw Rachel Cullen hit a 3-pointer and Andrea Meals add four points to cut the deficit to seven, 39-32, on a Meals jumper with 32.8 seconds left in the third quarter. Colledge, who scored 11 while hitting three 3-pointers, stopped the A-C Valley momentum when she hit a 3-pointer just before the third-quarter horn to put Everett up 10, 42-32, going to the fourth. The Lady Falcons were still within 10, 44-34, following a Kylee Eaton basket 6:21 into the fourth, but any hopes of a comeback went away when Olivia Boocks was called for two fouls in a span of about 30 seconds that had Sherman and the A-C Valley faithful upset and for good reason. The first was a charge called on Boocks as she drove the baseline when the Everett player clearly jumped out of the way of Boocks before contact was made. But instead of shooting two, Boocks was whistled for her fourth foul. “That was horrible,” Sherman said. Then moments later Boocks was called for fouling Maxwell. The problem was, Boocks didn’t foul her. Cullen did. But the official got the number wrong, the A-C Valley senior and KSAC MVP was disqualified on her fifth with 4:28 to play and the Lady Falcons now down 14 thanks to the two Maxwell free throws, 48-34. Sherman tried to get the officials to discuss the call, but instead of worrying about whether the call was on the proper player, the official was more interested that Sherman was a half a foot out of the coach’s box. With Boocks on the bench, things fell completely apart of A-C Valley with Everett going on a game-ending 12-2 run to make the final score look worse than it was. Sherman, while making sure to stress that he didn’t think it would have made a difference, wasn’t happy with the way the game was called. Everett, which was a jump-shooting team without a strong inside presence, shot 20 free throws to A-C Valley’s seven despite the Lady Falcons were a team that likes to go to the basket. The loss brings an end of an era of sorts that included this year’s seniors as well as last year’s seniors – Ellie Thompson and Allison Sherman – who took A-C Valley girls’ basketball to places never seen before. Prior to a year ago, the Lady Falcons had never won a PIAA playoff game. But this group went 43-11 over the last two season with three PIAA victories and two District 9 runner-up spots – one in Class 1A and one in Class 2A. Sherman credited the players for all of the success. Everett (24-3) will play West Middlesex in the semifinals Monday, March 18, at a site and time to be announced. Elizabeth Jay 1 0-0 2, Brooke Colledge 4 0-0 11, Kristen Ewing 1 2-4 5, Annie Nave 0 0-0 0, Gabby Bulger 1 1-2 4, Madison Hicks 3 2-2 8, Kaitlyn Maxwell 10 6-10 26, Laine Treece 0 0-0 0, Ashlyn Hicks 0 0-0 0, Alex Iseminger 0 0-2 0, Lilly Mills 1 0-0 3. Totals 21 11-20 59. Cami McNany 3 2-2 8, Rachel Cullen 2 0-1 5, Mia Sherman 0 0-0 0, Emily Wetzel 1 0-0 2, Andrea Means 1 2-2 4, Olivia Boocks 3 0-0 8, Kylee Eaton 4 1-2 9, Meah Ielase 0 0-0 0, Samantha Redmond 0 0-0 0, Rylee Bowser 0 0-0 0, Paige Klinger 0 0-0 0, Baylee Blauser 0 0-0 0. Totals 14 5-7 36. Three-pointers: Everett 6 (Colledge 3, Ewing, Bulger, Mills). A-C Valley 3 (Boocks 2, Cullen).